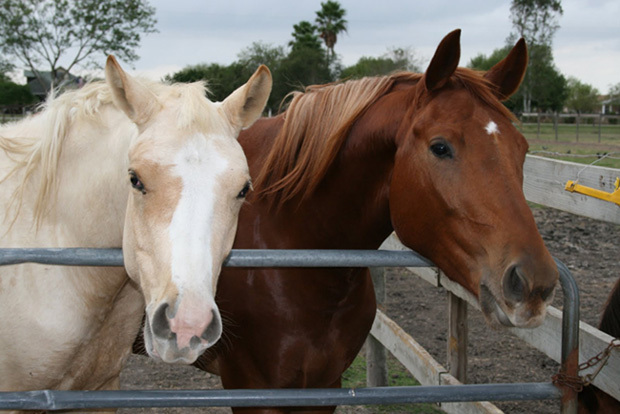 Kianga, the palomino, and his half-sister Xena have their sire, Stormy, in common. Both inherited their father's good looks, temperament, movement, and appreciation for affection and carrots. Farasi Farm is a horse farm located in the countryside near the town of Los Fresnos in the Rio Grande Valley of Texas. Expert riding instructor and horse trainer Alex Quiroga manages the farm. Alex lives at the farm providing supervision day and night. In this pleasant south Texas setting, Farasi Farm has three barns, a large outdoor arena with jumps, acres of pastures and paddocks, and two homes. It is surrounded by miles of farmland which allow endless trails to be explored. English-style riding lessons are given to students by expert horseman, Alex Quiroga, including hunter, jumper, eventing, and dressage. Lesson horses are available for beginning riders. Alex also provides his expertise directly to the horse through training, as arranged by each owner. Farasi Farm Owner Dana R. Allison is a horse lover and trial lawyer. "Farasi" is the swahili word for "horse." All breeds and riding styles are welcome.